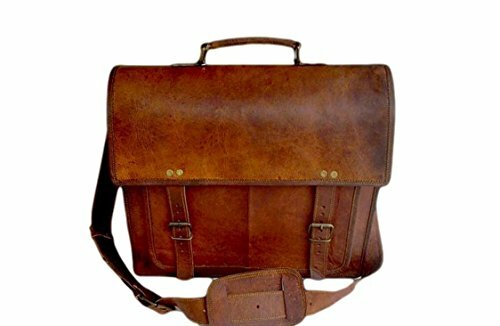 Our rugged distressed style laptop messenger shoulder satchel briefcase bags are all built to last the test of time. All genuine vegetable tanned goat leather is 3-4 oz, processed to withstand almost any condition. Features include; variety of inside and outside pockets for convenience, adjustable shoulder strap, and a durable canvas lining. Goat leather used for these bags is still processed in the traditional ways that have been around for generations. It is not processed by use of chemicals or dyes but by traditional methods of sun tanning and hand done vegetable oil polish. The leather also gets softer with age and develops a unique texture and finish. New leather smell will fade after 2-4 weeks of use.